Vegetables and chicken breast pieces in a mild curry sauce. Stockwell & Co. provides all the traditional pantry essentials you need to put good, honest food on the table – at a price that's always right. Vegetables and chicken breast pieces in a mild curry sauce. 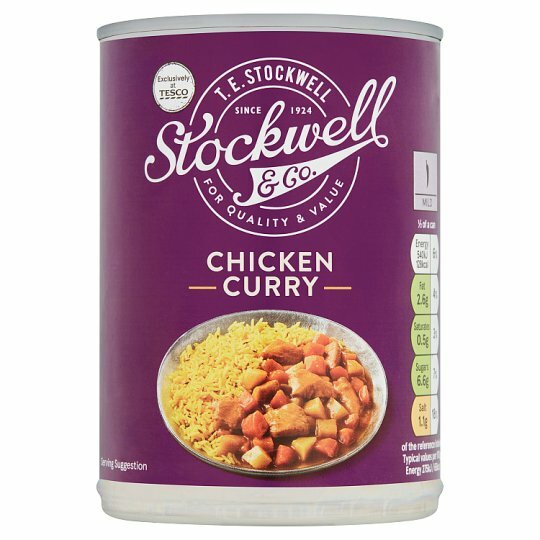 INGREDIENTS: Water, Vegetables (33%), Cooked Chicken Breast (14%) [Chicken Breast, Salt], Tomato Purée, Wheat Flour [Wheat Flour, Calcium Carbonate, Iron, Niacin, Thiamin], Apple Purée, Modified Maize Starch, Sugar, Cornflour, Chicken Fat, Sultanas, Salt, Rapeseed Oil, Cumin Powder, Coriander Powder, Turmeric Powder, Garlic Powder, Cardamom, Chilli Powder, Fennel, Caraway, Ginger Powder, Cassia, White Pepper, Black Pepper, Clove Powder, Fenugreek, Pimento Powder, Nutmeg, Cinnamon Powder, Black Pepper Extract. Vegetables in Varying Proportions: Carrot, Potato, Onion. Instructions: For best results, microwave heat. MICROWAVE Empty contents into a non-metallic bowl and cover. Microwave for 800W 2 mins/900W 1 mins 20 secs. Stir, then microwave for 800W/900W 1 minute. Leave to stand for 1 minute after heating. Stir well before serving. Instructions: HOB 4-5 mins. Empty the contents into a saucepan. Heat gently for 4-5 minutes, stirring frequently. Do not allow to boil.